Earlier this month I travelled to Michigan for the IMS Global Learning Consortium’s quarterly meeting. The meeting was hosted at the University of Michigan, Ann Arbor, the home of “Dr Chuck”, the father of the IMS Learning Tools Interoperability (LTI) protocol. 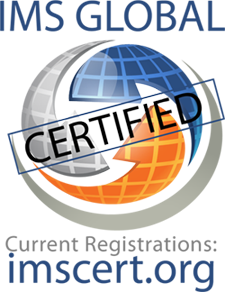 I’m pleased to say that, while there, I put our own LTI Connector through the new conformance test suite and we have now been certified against the LTI 1.0 and 1.1 protocol versions. The new conformance tests re-enforce a subtle change in direction at IMS. For many years the specifications have focused on packaged content that can be moved from system to system. The certification process involved testing this content in its transportable form, matching the data against the format defined by the IMS data specifications. This model works well for checking that content *publishers* are playing by the rules, but it isn’t possible to check if a content player is working properly. In contrast, the LTI protocol is not moving the content around but integrating and aggregating tools and content that run over the web. This shifts conformance from checking the format of transport packages to checking that online tools, content and the containers used to aggregate them (typically an LMS) are all adhering to the protocol. With a protocol it is much easier to check that both sides are playing by the rules — so overall interoperability should improve. In Michigan, the LTI team discussed the next steps with the protocol. Version 2 promises to be backwards-compatible but will also make it much easier to set up the trusted link between the tool consumer (e.g., your LMS) and the tool provider (e.g., Questionmark OnDemand). IMS are also looking to expand the protocol to enable a deeper integration between the consumer and the provider. For example, the next revision of the protocol will make it easier for an LMS to make a copy of a course while retaining the details of any LTI-based integrations. They are also looking at improving the reporting of outcomes using a little-known part of the Question and Test Interoperability (QTI) specification called QTI Results Reporting. After many years of being ‘on the shelf’ there is a renewed interest in the QTI specification in general. QTI has been incorporated into the Accessible Portable Item Protocol (APIP) specification that has been used by content publishers involved in the recent US Race to the Top Assessment Program. What does the future of QTI look like? It is hard to tell at this early stage, but the buzzword in Michigan was definitely EPUB3. Learning Tools Interoperability fulfills its promise! In previous blog posts I’ve discussed the new specification that the IMS Global Learning Consortium (IMS) has been working on called Learning Tools Interoperability or LTI for short. See my first post on this subject here and the later update here. In March, IMS released the final version of the specification. This clears up any confusion between the earlier variants (Basic and Simple have been used as prefixes in the past) and sets a single standard for embedding tools in learning management systems (LMS) and portals. The final specification also introduced an important new feature: a method of returning grade information from the tool to the LMS gradebook. At Questionmark we have developed a number of connectors for integrating with popular learning management systems and portals, such as Blackboard and Moodle. LTI provides us with an opportunity to replace those connectors with a unified approach to integration, so I can’t wait to get started with the new specification. To this end we are now working on adding LTI support to our own software. I recently attended an IMS workshop called “Creating Enterprise Aware, Multiplatform Apps with IMS Interoperability”. At this workshop we heard about the latest developments in both IMS Common Cartridge and IMS LTI. It was a great to meet some of the key people in the community and take a deep-dive on some of the technical details involved in implementing the specifications. 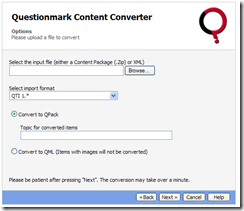 So how will Questionmark integrate using LTI? In LTI terminology there are tool providers and tool consumers. A tool consumer is typically an LMS or other type of portal that deals with user registration and assignment to courses where learning and assessment activities are aggregated. A tool provider is a web-based service that provides a specialized experience to the learner such as an assessment. Our first steps with LTI are aimed particularly at users of the Moodle LMS, though anyone with access to a web server running PHP and a suitable database will be able to integrate this way. 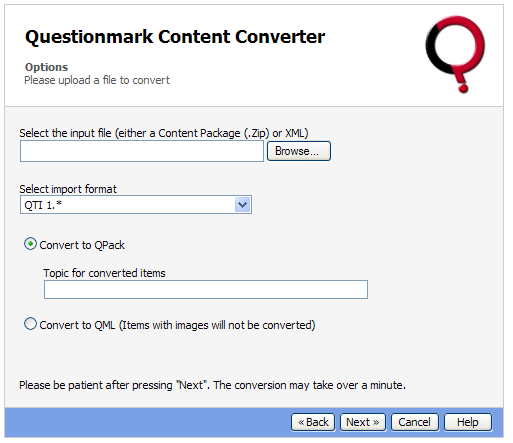 We’ve teamed up with an LTI specialist, Dr Stephen Vickers, to create an open source Community Edition connector that makes it easy for Moodle users to talk to Questionmark software using the new LTI protocol. The project is hosted on the OSCELOT community development system. This is just the beginning for Questionmark and LTI – so stay tuned for more updates on the role LTI will play in future Questionmark assessment technology solutions! I’ve prepared a video podcast which is your introduction to key interoperability standards for elearning. It also serves as my introduction to video podcasts. Your feedback on both the content and the style will be put to use as I continue the series—so please post comments or send email. The video for Part 1 provides a quick overview of the need for interoperability standards, the names of the keys standards, and the types of interoperability they support. Part 1 addresses AICC, ADL SCORM, IEEE LTSC and IMS specifications at a high level. It introduces the concepts of run-time communication, content packaging, and meta-data. I hope you find it a good refresher if you are already somewhat knowledgeable about these standards, and an excellent introduction if you are new to most of this.